Represents the Temple in Jerusalem. Appears in the Emblem of Israel. Represents the festival of Sukkot. Often an accompaniment of the Menorah. Represents the High Holy Days. Often an accompaniment of the Menorah. 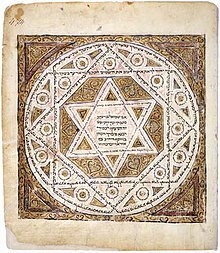 The Star of David, a symbol of Judaism, as a religion, and of the Jewish people as a whole. And it also thought to be the shield (or at least the emblem on it) of King David. Symbolizes El Shaddai (conventionally translated "God Almighty"), one of the Names of God in Judaism. This symbol is depicted on the ritual objects mezuzah and tefillin, and in the hand gesture of the Priestly Blessing. Represents the two tablets on which Moses inscribed the Ten Commandments at Mount Sinai. The Tanakh compares the tribes of Judah and Dan to lions: "Judah is a lion's whelp."